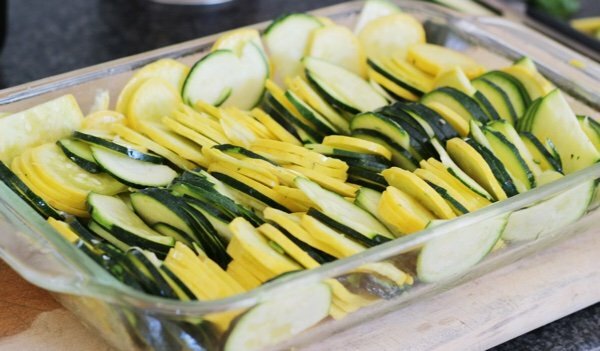 This recipe for baked yellow squash also includes some green squash (mainly for color). It is a different take on my very successful roasted summer squash recipe (but it is a little more work). I find that this is a great lower calorie replacement for those of us who like potatoes gratin (potatoes with cream, cheese, and bread crumbs). Summer squash has less calories than potatoes and is quite sweet on its own. I also like to core out my squash and make Mexican zucchini boats. This dish can be very pretty if you are more patient than I am. 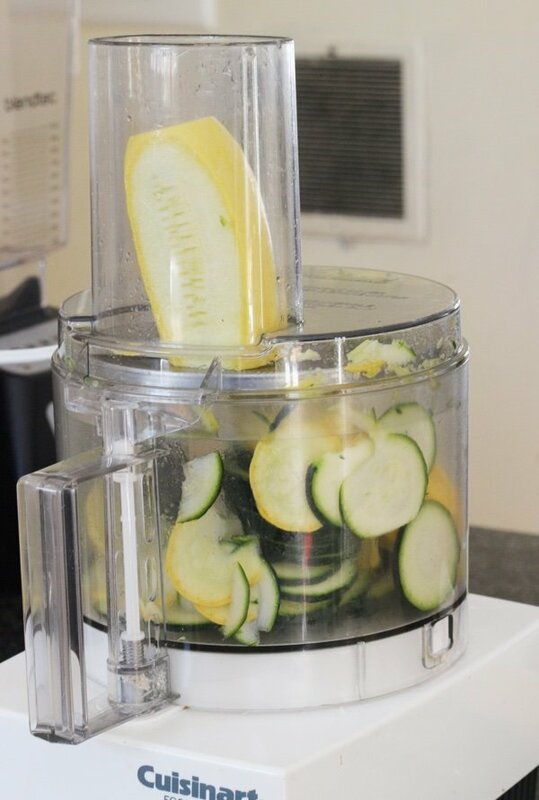 I use my Cuisinart to slice up the squash and that saves time. You can use a sharp knife or a mandolin slicer if you have one. But, then you can make a pretty pattern with the squash slices and, while I tried, I am sure other food bloggers would do a better job. This could be a truly pretty side to bring to an Easter brunch or any event where you want to impress with vegetables. I know! It is SO much easier to impress with cupcakes. I get it. But you can’t only eat cupcakes. I will say that once I start eating this, I find it very hard to stop. Why would you need to stop for only 122 calories per serving? I preferred this dish at room temperature to super hot. If I cover things in cheese and breadcrumbs my children will at least try it. My daughter liked it (and my son did not). This goes well with grilled fish, chicken, or steak. Soon steak and squash will be on the menus of all the finest steak houses in the nation and no one will eat the lowly potato any more. Low carb fanatics eat everywhere! Heat oven to 350 F. Remove the stem ends of the squash and slice thinly using a mandolin attachment to your food processor or a sharp knife. Mix sliced squash in a bowl with olive oil. In a small bowl, mix Parmesan, bread crumbs, salt and pepper. 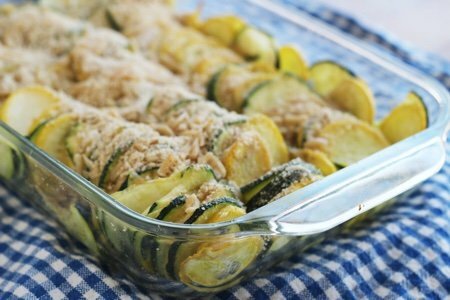 Place squash in a 9x12 inch casserole, sprinkle with bread crumb mixture, and cover with foil. Bake for 40 minutes. Remove foil and bake another 5-10 minutes until bread crumbs look toasted. 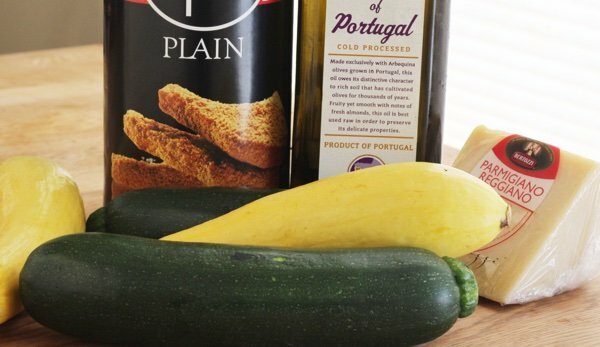 The picture of Baked Yellow Squash looks like it has another ingredient not listed in the recipe. 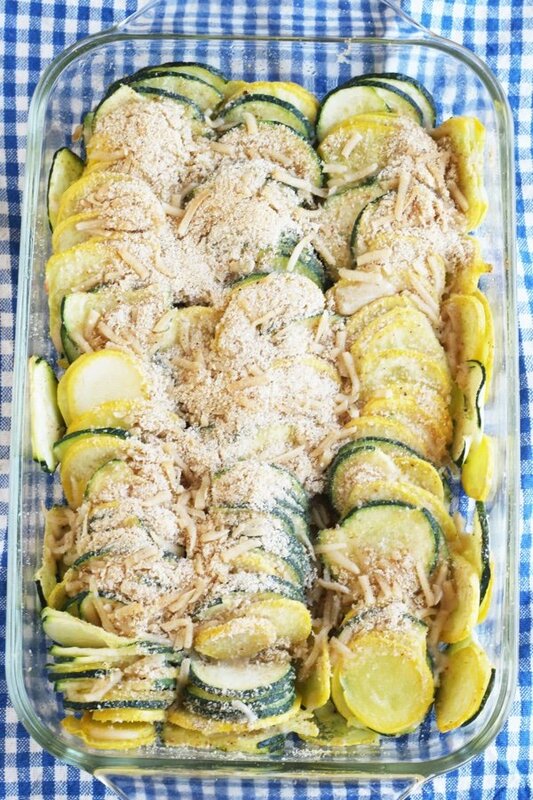 What are the little light colored strips sprinkled on top of the squash? and squash to start growing. Right now they are in my green house and just beginning to put out leaves. No, there is none in our local stores as yet. DARN! Looks great -- I would imagine it could be a bit watery. It seems like you did not have that issue. Did you do something to help with that? @Lynn - I shredded the parmesan instead of grating it and that worked from a flavor perspective but from a photo perspective - not so much. @Leah - Hit the "print" button in the recipe and no ads will print. @Suzanne - it did not get watery because the squash still retained a little crunch. It would get watery if it was cooked for a longer period of time. Thanks for all of your wonderful questions! Green and yellow squash are called courgette in my part of the world. I have to say that the idea of baking them is a great one. And I have just seen your comment about cooking them but not overcooking them so that they stay crunchy. Brilliant advice. I think I may add a little bit of bechamel. I am still indecisive about this, but definitely will cook some. I ran this through my old Smart Points calculator, and it came out as 4 points. I don't understand why there would be a difference between the Smart Point count and the Freestyle point count, because there is no ingredient in there that would be free in Freestyle but not in Smart Point. Am I missing something? It looks like a great recipe, but 4 Smart Points is a lot for a side dish.